Why You Need an H.264 Converter/Encoder? 1. With the use of H.264, it's reported that bit rate can be saved up to 50% or more compared with current MPEG-2 implementations, thus reducing the size of the video by 50%. 2. H.264 reduces the bandwidth used for sending video files over internet. 3. H.264 reduces the storage space used for storing huge video files. 4. by converting to H.264 AVC, videos shot from higher resolution cameras can be streamed over the internet. 5. H.264 is a standard. It is widely applied to a wide range of devices, networks and systems. So with H.264 converter, other videos are encoded into H.264 that is widely compatible with devices, game consoles, computers, etc. What Will the Best H.264 Converter Do for You? As H264 towers above other video compression formats due to its foregoing mentioned merits, no wonder the public highly adore it and thirst for an H.264 converter to decode videos and reencode them into H264, for either space saving, uploading or wide playback on Xbox One, PSP, iPhone, iPod and so on. To free you from the daunting task in finding the best H264 encoder in the market, here the perfect H264 video converter is commended - MacX Video Converter Pro. The program tops other H.264 converters simply because of its built-in all-inclusive video/audio codecs, as many as 370, including web videos from YouTube, Facebook, Vimeo, etc; SD videos in MP4, FLV, WMV, MOV, 3GP, WebM, DivX, MPEG; HD camcorder videos in AVCHD, Blu ray, MKV from Sony, Pansonic, JVC, etc, and even 4K UHD. Almost all video files can be converted to or from H.264 for your diversified needs. On top of that, despite H.264 encoding and decoding consumes a lot of CPU resources, especially when it comes to the HD/4K contents, this H.264 converter manages to deliver a superfast video transcoding speed. By employing Hyper threading technology, Multi-Core CPU, and mostly the world's first Intel QSV hardware accelerating tech, the video converting speed is much faster, almost 5X faster compared with other H.264 converters. Step 1: Import Video Files. Free download this H264 video encoding software and launch it, then click "Add File" to load the video files which you want to convert to H264. You can also check the Mac H.264 converter version to do the H.264 encoding/decoding. Step 2: Select Output Format and Choose H.264 as Codec. Select the output video format you desire. For example, if you want to encode video to MP4 with H.264 codec, you may choose "MP4 Video (H.264)". Note: With this video to H264 converter, all the profiles are preset for you to easily make a selection, without changing parameter settings. Supposing you are inclined to customize the output video to best suit your specific needs, you may adjust the output video parameters, including resolution, frame rate, bit rate, sample rate, etc with no sweat. Press the "RUN" button to start converting video to H264 on Mac, this splendid H264 video converter for Mac will automatically help you convert video to H.264. You can barely close your eyes for seconds and then this H264 video converter can flawlessly accomplish this task. Warm prompt: The H264 video converter works as both an H264 mp4 encoding converter and decoder. So beyond smoothly converting video to H264 , you can also convert H264 to MP4, MOV, AVI, WMV, FLV and other file formats at your disposal. It is also capable to download HD YouTube video to plethora of formats no matter HD videos (AVCHD, TS, MTS, MKV) or SD videos (YouTube video to MOV, H264, MP4, AVI). Plus, it's also thoughtful enough to provide you with on-screen recording feature to record any on-screen activities like game video recording or non-downloadable videos for offline enjoyment. Converting speed stands as a key factor when users picking their best converter. 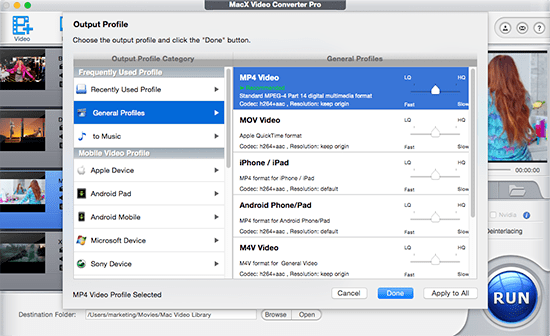 In fact, MacX Video Converter Pro will be the best video to H.264 Mac converter as it is no exaggeration to say that this software has the fastest conversion speed. This is because it's a h264 hardware encoder that pioneers the use of Intel's QSV hardware acceleration tech, which use a specific unit in Intel for the H.264 video conversion speed while keeping other tasks on Mac computer unaffected. Together with Hyper threading technology, Multi-Core CPU, now the speed is about 5x faster than others. Test: To better illustrate its performance, here we make a comparison between MacX Video Converter Pro and HandBrake. In the test, we convert a MP4 (AVC) file (3846X2160, 4.30min, 520MB) to H.264, 1280x720 with both Mac H.264 video converters. The test results indicate that MacX doubles the h264 conversion speed on Mac, with the average proecessing capability reaching 205 FPS vs 109 FPS with Handbrake. Some H.264 converters for macOS sacrifices quality for speed. For example, Handbrake has 1-pass and 2-pass encoding. While 1-pass will convert video to H.264 on Mac with faster speed, it results in lower quality. And the 2-pass encoding is exact the opposite. While hardware acceleration ensures the No.1 fast speed in MacX Video Converter Pro, another technology is applied to guarantee untouched output quality. With a high quality engine built-in, it keeps a perfect between the quality and conversion speed. It's hard to describle the image quality that the Mac h264 video converter can keep and you may have a different judgement based on personal feelings. So below we list the the output quality of H.264 video produced by the two converters (MacX on the left, Handbrake right) with the same video tested above. Fast speed and high output quality are not the only strength that make it the best video to H.264 Mac converter. In addition to converter videos to H.264, H.265, MP4, MOV, AVI, MKV, WMV and almost all other digital formats, it is a combo of a various bonus benefits you may expect from the supreme converter. * Make slideshows videos and convert to H264 on Mac. Follow the tutorial to convert 3GP to MP4 with high quality and 5x faster speed than free 3GP to MP4 converter such as Handbrake and FFmpeg, and play 3GP on iPhone iPad Mac etc. without format compatibility issue. MacX Video Converter Pro is an all-in-one video editor and converter with top quality and fast speed. This feature-rich video converting software also can help you easily download HD or SD videos from YouTube, Vevo and more 1000+ sites.